Sometimes you just can’t get through a whole loaf of bread, amiright? As you rush through the kitchen doing and making other things, you see the lonely loaf, and think, “I must do something with that before it goes stale!” And then it goes stale. So what’s a cook to do? Well, I had doubled Abby Dodge’s Peasant Boule recipe (but not the yeast! use 1.5x yeast to double the recipe!) and neglected to freeze one of the boules. The boule entered Stalesville before my family could eat it. So I made a delicious savory bread pudding that even the toddler enjoyed! And with Passover coming next week, here’s a quick way to use up a loaf *this* week! 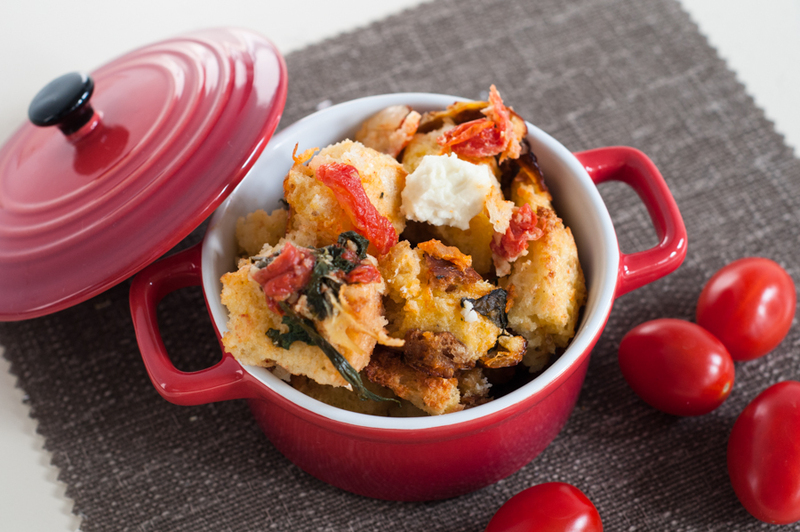 Or try it as a matzo casserole – mmm! Mix together the first 6 ingredients in a greased 9×13″ glass pan. Add salt and pepper as desired. Moisten the bread (but do not soak it) with milk. Bake at 350 for 30 minutes or until baked through and lightly browned. And you thought bread pudding was hard! Ha! Do you have a savory bread pudding recipe that you love? Easy peasy, and oh so pretty!